Summer in Japan can be the absolute worst. It's hot, humid, and everyone's sweaty. Though it's not quite summer yet, I can feel it fast approaching. Convenience stores are already stocking up on cool snacks and kids are riding their bikes around and playing in the river. Nice, except for the killer heat. Today, I'll be sharing with you my favorite summer Japanese dish, hiyayakko and a recipe for it. Now, hiyayakko is essentially just cold tofu with some garnishing. But it's much better than that description makes it sound! 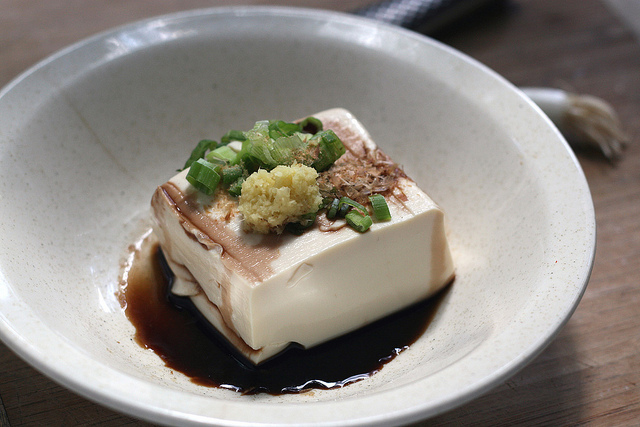 It's creamy soft tofu that's ice cold and melts in your mouth, a salty-savory sauce, and the crispness of green onions. My mouth is watering just thinking about it! (6) Enjoy! Add more sauce if you'd like more. I personally like a lot of sauce! So, super easy, right? Something that's so simple, yet so delicious. I love the way all the flavors just meld together. And it's nice and cool, so perfect for summer. You can add other flavors as well. I know some people who eat it with wasabi and ginger paste (though I feel the wasabi removes the mild flavor of the hiyayakko that I enjoy so much). Let me know what your favorite Japanese summertime treats are below!